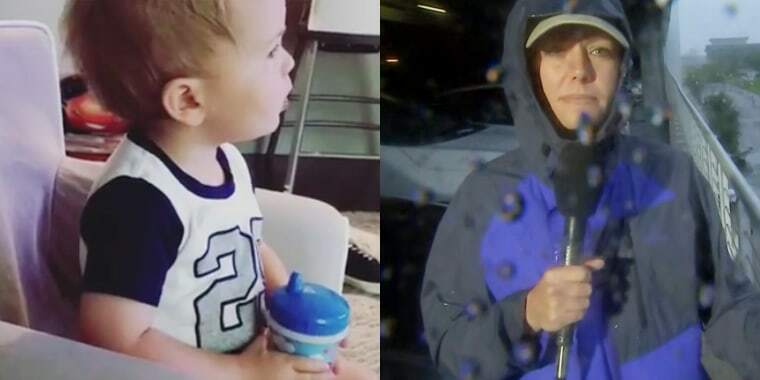 Heavy winds and rain worried one little viewer who tuned in to watch Dylan deliver the news on Hurricane Florence live Friday morning. TODAY's meteorologist and more, Dylan Dreyer, started her day reporting live from the rain- and wind-battered shore of Wilmington, North Carolina, to bring viewers the latest on Hurricane Florence. And one viewer found her dedication to deliver the news in those conditions just a little distressing. Dylan's 20-month-old son, Calvin, tuned in to see her on TV Friday morning, but as he watched, he couldn't help but wonder if those were raindrops or teardrops running down Mom's face. Calvin's dad, Brian Fichera, recorded the little one's reaction. Calvin seemed captivated by the coverage of Hurricane Florence from the comfort of his personalized armchair in the clip, when he suddenly turned to Dad and asked, "Mommy crying?" That's when his father reassured him in an upbeat voice. "Mommy's OK, right?" Brian said. "Mommy OK."
And that's all it took to turn Calvin's concern face into a happy one. In the caption alongside the video on Instagram, Brian added, "Mommy’s not crying bud mommy’s a pro. Thoughts and prayers with everyone in the path of #hurricaneflorence." He also added the supportive-hubby hashtag #godylgo. No worries there. Dyl is doing a great job. Still, we're sure Calvin can't wait to have her back home.